This past weekend was a long holiday weekend in Korea. Many folks took the time to get some R&R by taking trips abroad but I stayed put and with no big agenda on the schedule, I was invited by my close family friend to go down to Gwangju with his family as they gathered to take part in a Korean jesa ceremony (제사). 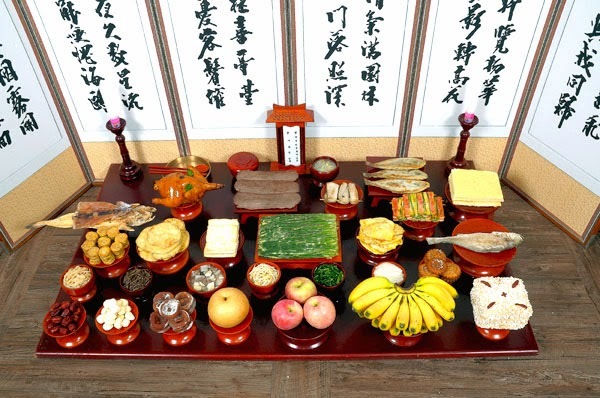 In a jesa ceremony, observance and memorial of one's ancestors are made with elaborate preparations and a wide variety of fruits, drinks, snacks, and other food offered to the ancestors. There's a range of different jesa types which also differs a bit in form and offerings by regions but the traditional jesa ceremony has been observed for hundreds of years in Korea and is still practiced by many Koreans today. Coming from a Christian household, my family and relatives didn't partake in jesa and most Korean protestant Christians (both in Korea and abroad) still do not do jesa while Korean Buddhists, Catholics, atheists still observe the ceremony a few times each year. Fundamentalism and religious doctrines aside, I had the fascinating experience of watching my first jesa ceremony which I took in as a nifty cultural experience. In addition to the scale of food, it was interesting to note that preparations to the last details were made as though very honored guests were expected to physically arrive soon. Floors were vacuumed and wiped down, all the special jesa plates/holders were carefully unwrapped from newspapers and wiped down so they were shining again, and candles/incense were all readied. There was something that was both elaborate yet homely about the thing as everything was done inside the home. And in the end, the entire family and relatives would enjoy the food together and share in laughter and company. With most families spread out in different parts of Korea, these jesa ceremonies offers a chance for families to gather together and, as one of the uncles said, "Gives us an excuse to see each other and to eat our hearts out." In the States, Thanksgiving and Christmas are often the big holidays that reunites family but it's interesting to note that so many cultures have similar customs in which family get together over a major occasion with good food and drinks. Just goes to show no matter your custom, culture, and traditions, there truly is no center glue to bring loved ones together like food! Does your country/culture have similar food-centered traditions that reunites relatives and family? There's a number of regional specialty foods around Korea such as Andong's jjimdak, Chuncheon dak galbi, etc. In Gwangju, the biggest city of the Jeollado region, a unique specialty of the region is fried squid and lettuce wraps which is a bit confusingly named "sang choo twee gim" or (상추튀김) as the Korean name seems to imply the lettuce itself is fried. However, in this dish squid is battered and fried, sometimes with bits of other diced veggies, and the fried pieces are then placed on a lettuce leaf. A special soy sauce-based dressing is provided on the side with plenty of chopped onions and spicy peppers in it which you spoon a bit onto your wrap and eat. The dish is said to have originated around the area in the 70's to a woman who was selling fried foods on the street. She developed the way of eating to provide more sustenance for the poorer folks back then and the dish has since spread in popularity to the point it has become nearly synonymous with Gwangju. My friend's aunt, who is a Gwangju native, shared how she used to eat this with her friends after school in her high school days and she shared how huge the servings were for the prices back then. This dish definitely took me by pleasant surprise. I'm not the biggest fan of fried dishes (also known as "twee geem" or 튀김) but the spicy/savory sauce with little kicks from the diced onions and peppers helped offset the fried batter while the lettuce wraps gave a nice, softer crunch to the whole thing. It's not a dish that will blow you away off the bat but is pleasant to eat and you'll find yourself thinking about it after a few days. Try it out the next time you pass through the Gwangju or Jeollado area. There's apparently a select few bunshik stores (fast eat stores) that sells them around Seoul too, though I haven't been so I can't vouch for their taste or authenticity. I'm terrible at growing plants. Anytime I've received flowers or potted plants in general, I seem to have a habit of killing them no matter how much I follow instructions. What's even worse is that the plants always seem to die a painfully slow death, leaf-by-leaf, which makes me feel all the more terrible. Despite all this, I've long wanted to grow my own veggies. My place has a large veranda which, coincidentally, receives the most sunlight of all our house and is a prime location to grow plants. Overcoming the guilt of my plant serial killing past, I ordered a lettuce growing kit online (as I heard lettuce was one of the easier vegetables to grow), and planted the thing. Now there's even more sprouts and they're all quite long too. Definitely beaming like a proud father now. Crossing my fingers that they'll keep thriving! I'm feeling a breathless anticipation I last felt crossing rivers on the old Oregon Trail games hahaha.